A Stash Swap is a great way to add variety to your stash! Last June, we swapped fat quarters of low volume fabrics and it went so well, we’re going to do it again. At our February guild meeting, we’ll be swapping fat quarters of TEXT FABRIC! What’s a text fabric? 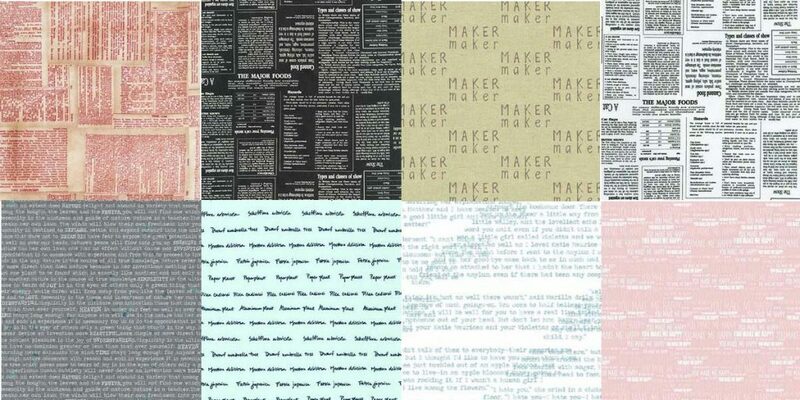 It’s a fabric with text, either words or letters, printed on it. Pretty simple, right? 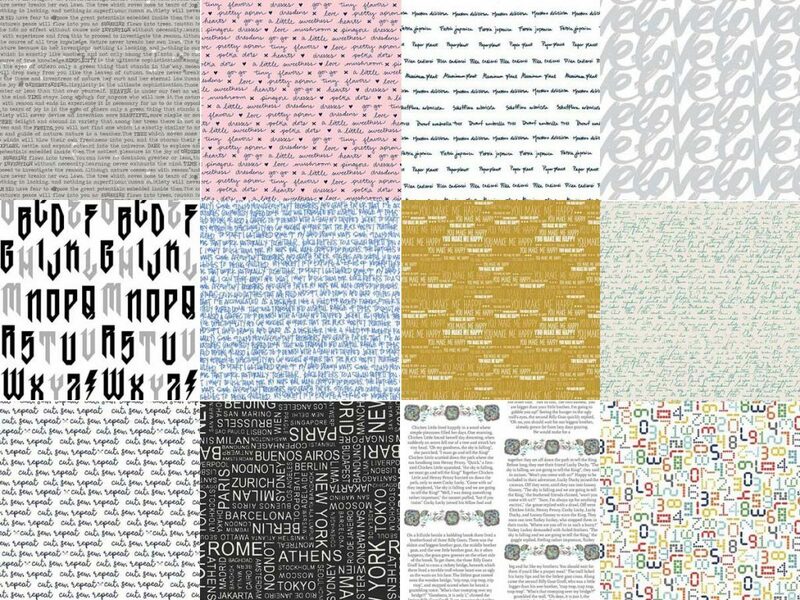 The fabric you choose should be a MODERN text fabric, where the letters or words are the MAIN FOCUS of the print. So that fun map print with scattered words written on it? Not really a text print. The print that shows quotes from Anne of Green Gables? 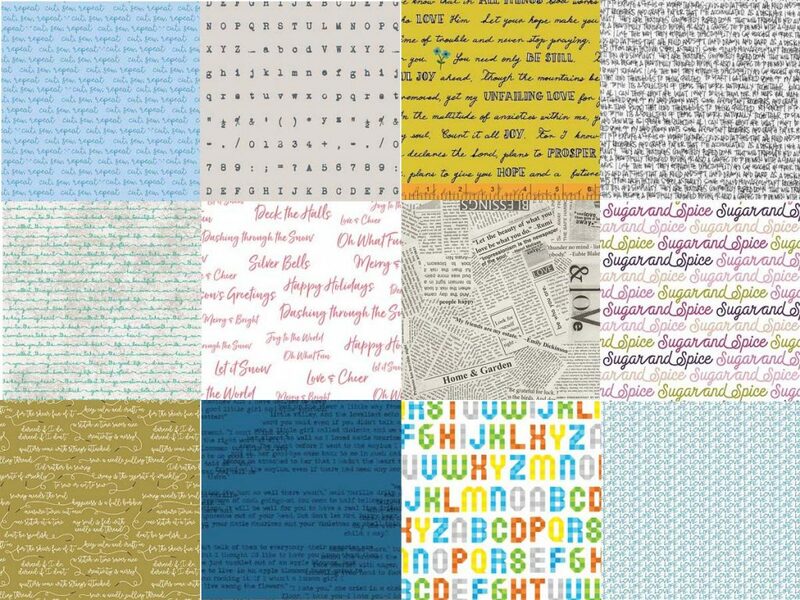 Totally a text print! You bring a gallon ziplock bag clearly labelled with your name with 4 fat quarters in it. Each person can bring up to TWO bags – that means 8 fat quarters, but keep them in separate bags for ease of swapping. Fat quarters can be either US or Canadian, either size is fine. If you bring Canadian size FQs, be aware that you might receive US size FQs back. When you arrive at the February meeting, there will be a table set up to drop your bag(s) off. Amy, Michelle and Holly will swap the fat quarters between the bags, and after the meeting, you’ll come back and pick up your bag, with 4 new FQs in it! Easy peasy, right? We’ll do what we can to make sure you don’t get the same print back, but please feel free to swap among yourselves if you end up with something you already have. *It’s not fun, but we reserve the right to not swap your fabric if it doesn’t fit the guidelines. We have to be fair to others who do. 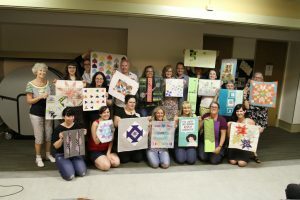 It’s been a while since we’ve done a swap with another guild, so we’re excited to announce a mini-mini quilt swap with Ottawa Modern Quilt Guild! It’s a small quilt with a minimum perimeter of 24″, and a maximum perimeter of 48″. That means length + length + width + width will add up to at least 24″, but no more than 48″. 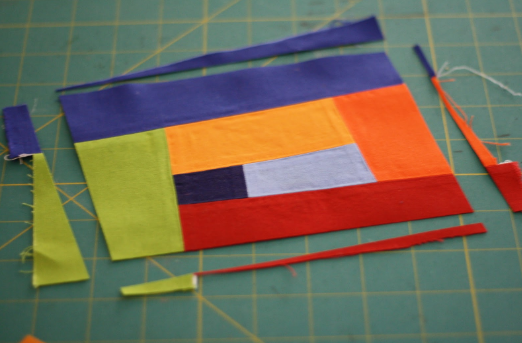 You can make your mini-mini quilt any shape you like, as long as it fits within 24″-48″ perimeter. A square quilt 12″ x 12″ would be the maximum perimeter. 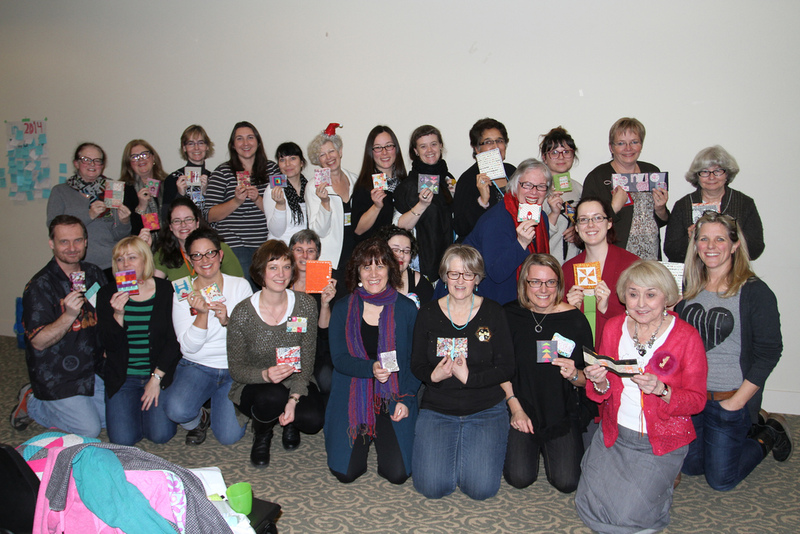 Remember how fun our mini quilt swap back in 2014 was? This will be just as great, but with quilts half the size! Wanna participate this time around? Here’s the details! – This is a SECRET swap. When you sign up, you’ll fill out a questionnaire. When you’re assigned someone to sew for, you’ll be sent their questionnaire. This means that you’ll get something made specifically for you, taking your likes and dislikes into consideration. Awesome! 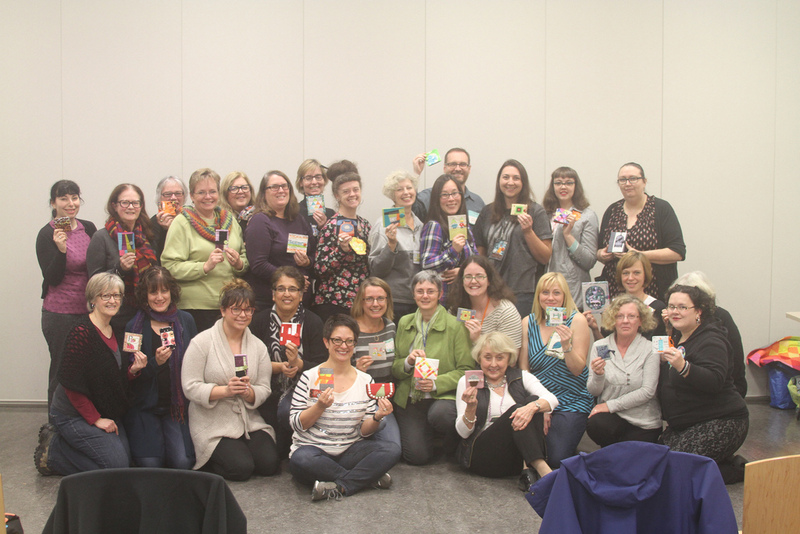 Most people will be assigned a partner from the Ottawa Modern Quilt Guild, though if the numbers are uneven, a few VMQG members might end up swapping with each other. The person you’re sewing for will not be the same person as who’s sewing for you. 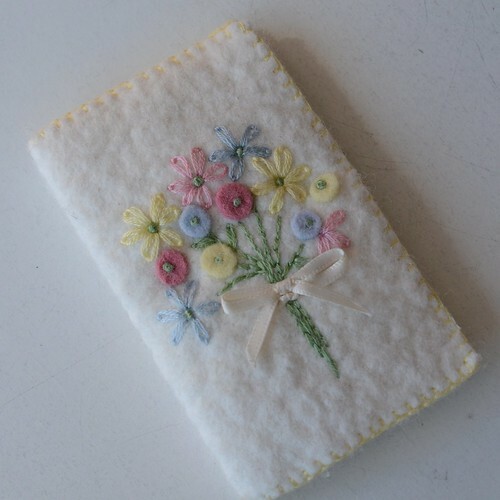 – You’ll be making a MODERN mini-mini quilt based on your partner’s likes and dislikes. Everyone has different levels of quilting experience, but we’ll all be doing our best possible work. – Since it’s a secret swap, hints and in-progress pics are totally welcome! 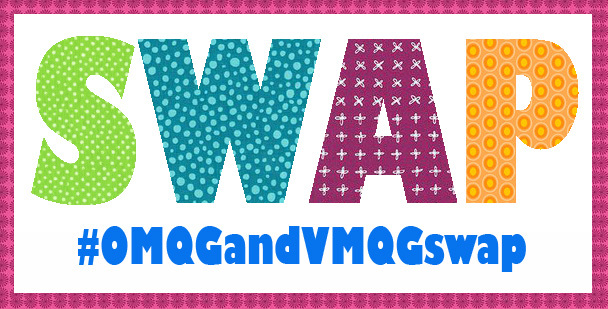 Please use the hashtag #omqgandvmqgswap so that we can all follow along. – Sign ups will start today, January 16, 2017, and will go to February 1, 2017. That gives you a little over two weeks to sign up. – Sign ups will be ONLINE only. – You’ll bring your finished mini quilt back to the April guild meeting, on April 17th, 2017. We’ll mail all of the quilts together to Ottawa, and they’ll mail all of theirs to us. Quilts will be distributed at the May guild meeting, on May 15th, 2017. – Quilts should have some sort of hanger attached. this can be a sleeve, triangles in the two upper corners, whatever works best for the quilt you make. – This is a members-only activity. supporting your guild has its perks! This year’s winter interguild swap is PINCUSHIONS! 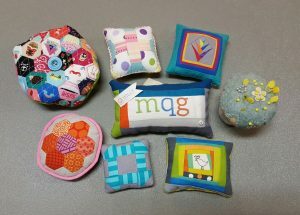 We did a pincushion swap a very very long time ago, with Kansas City MQG, so it’s about time we did one within VMQG! If you’d like to swap, no need to sign up! Just bring your finished pincushion to the December guild meeting, attach a tag to it so that the recipient knows who made it, and there will be a table where you can set it and let everyone else admire it. Later in the meeting, we’ll put the pincushions in paper bags, and have a secret swap, where everyone grabs a bag at random. Fun and simple! If you’re looking for inspiration, check out the pinterest board i made for the original swap and see if anything catches your eye. Several people asked about the pincushion i shared at the October meeting, the shape is called a biscornu, and it’s a traditional needlework shape. i found a great tutorial on how to make a fabric one here! We’ve decided to do a brown-bag swap of utility / crafting aprons at the PNW MQG meetup happening in Vancouver this weekend. We announced this on our meetup page over a month ago, but thought we’d blog about it here as well in case anyone wanted to whip up a last-minute apron. You totally have time to do it! The swapping will happen at the sew-out/potluck dinner at Trout Lake Park on Friday night to get the meetup started! 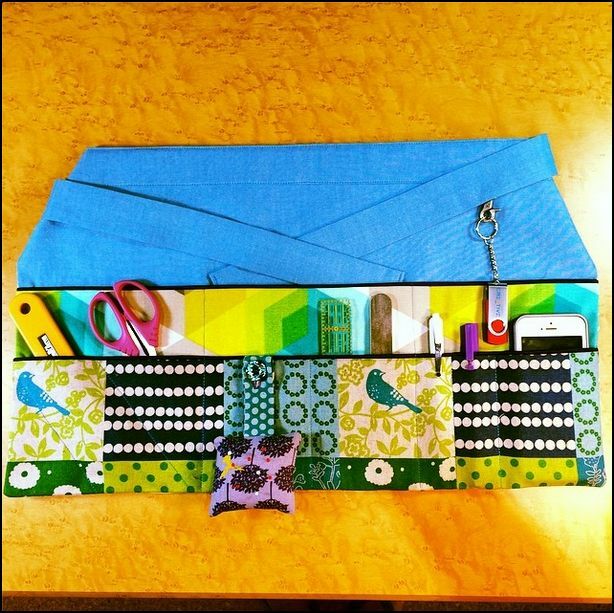 This swap will be similar to the tote bag swap at the 2013 PNW MQG meetup that the Portland MQG hosted — you can make an apron and bring it to the meetup wrapped or in a brown bag. Make sure you enclose a card with contact info so your swap partner can thank you! Bring an apron / take an apron — a blind swap. Participation is optional. These will be small, waist-down only aprons meant to be worn while sewing or crafting. As they are a garment, you may want to consider pre-washing your fabric, but it’s not mandatory. We’ve created a Pinterest board with some ideas to inspire you! We’re super excited to announce a new swap! We’ve done quite a few swaps with other guilds, but it’s been a while since we did one just within our group.We see so much amazing work within our guild (that’s why our Show and Tell rocks), it’s about time we shared that with each other! so! a Mini Quilt Swap! – this will NOT be a blind swap. when you sign up, you’ll fill out a questionnaire. when you’re assigned a partner, you’ll be sent their questionnaire. this means that you’ll get something made specifically for you, taking your likes and dislikes into consideration. awesome! – sign ups will start today, June 16, 2014, and will go to June 30, 2014. that gives you two weeks to get your booty in gear! – sign ups will be ONLINE. this will let Amy email your questionnaire to your partner without having to retype it all and try to decipher your handwriting. – that gives you 5 weeks to make something amazing! – mini quilts will have a minimum perimeter of 50″, and a maximum perimeter of 100″. 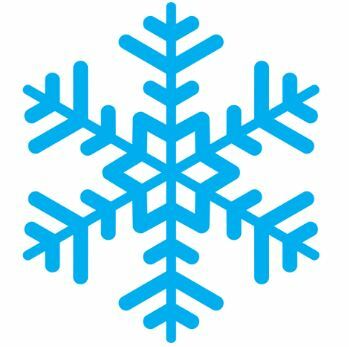 that means length + length + width + width will add up to at least 50″, but no more than 100″. you can make your mini any shape you like, as long as it fits within 50″-100″ perimeter. – there will be no extras in this swap. 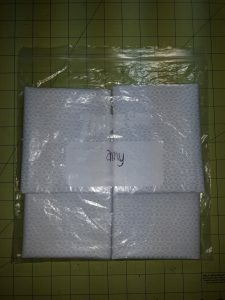 when you bring your quilt back (wrapped and labeled with your partner’s name), the only thing in the package should be the quilt. – please keep your summer schedule in mind when signing up. if you’re so busy that you might not get your mini finished in time, it might be better to wait for another swap. finding swap angels or dealing with late packages is no fun for your partner or for the organizer! interested? fabulous! sign up here! The holidays are rapidly approaching, which means our December meeting is coming soon too! We’ll be posting about the meeting itself, but we wanted to give you a bit of time to get started on a special activity that we’ll be doing at the meeting. We’re bringing back the holiday ornament exchange that we did for our first festive season together, back in 2010, and we’d love it if you joined in! The swap is simple – bring a handmade ornament, and you’ll get a handmade ornament in exchange. Easy-peasy! Your ornament can be of any style, as long as it’s handmade, so feel free to bust out your yarn or your sequins, if that’s how you celebrate the holidays. We’ll be swapping one ornament per person (it’s not a block lotto! ), but if you get carried away, ornaments make great gifts or door prizes. Back in 2010, Amy blogged links to 50 fabric ornaments on her personal blog. Since then, she’s created a pinterest board of Holiday Tutorials, most of which are ornaments. If you’re comfortable with winging it, she’s also created a board of Holiday Inspirations – no tutorials, but some great ideas! And if you’d like to check out our first ornament swap, there are some pics in our flickr group here. Go forth and create – we can’t wait to see what you make! 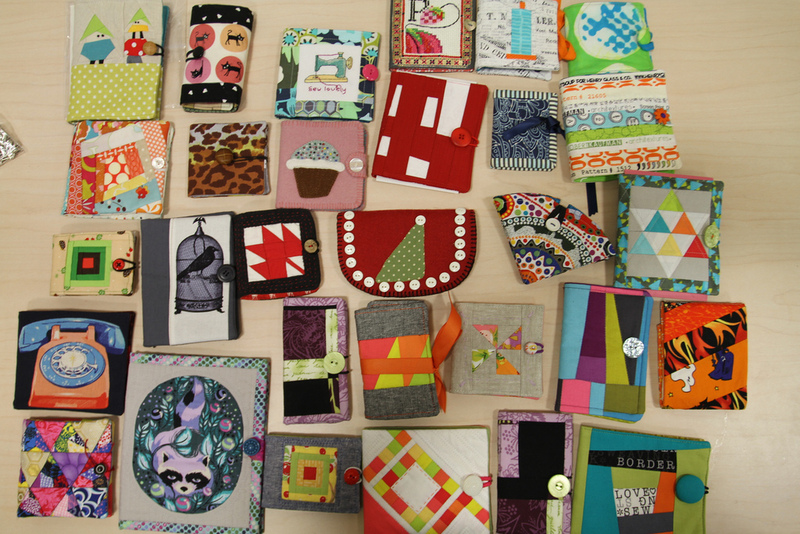 Who is up for swapping with the lovely members of the London Modern Quilt Guild? While I was in London in July, I met some super fun gals who were “dead keen” to swap with us! We decided that small and light would be the order of the day since swap items would have to ship across the Atlantic, so we’re going for needlebooks. The swap will be blind, meaning we’re not making for a specific person. This leaves you to create something you’ll enjoy making in any colours or design of your choosing. Please consider we’re swapping with a modern guild and let that guide your fabric/design choices. 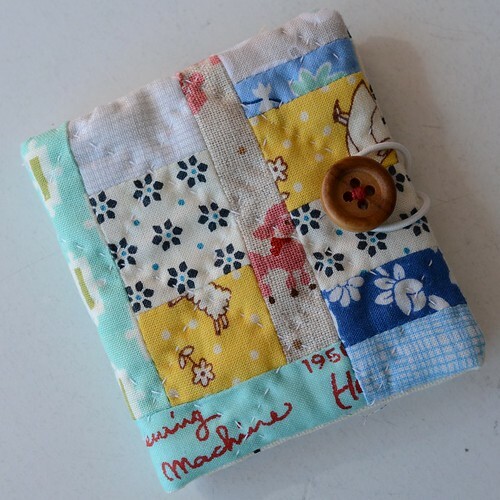 Amy has created a Pinboard with a gazillion ideas here: http://pinterest.com/amydame/needlebooks-and-sewing-kits/ For the purposes of this swap, we are sticking to simple needlebooks only, not full-blown sewing kits. 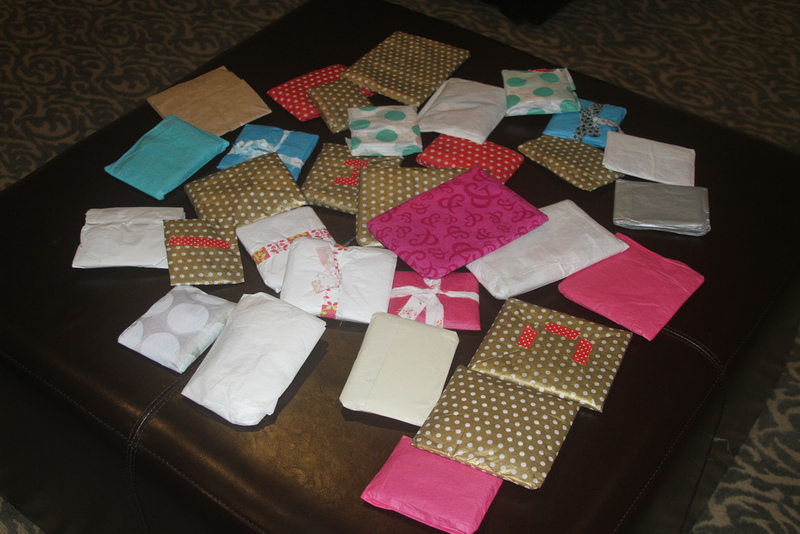 This way shipping costs will be kept to a minimum and everyone will receive a comparable swap gift. Please do NOT put any needles in your book! The swap is limited to approximately 20 and so far we’ve got 18 signed up so if you want in, be sure to put your name on the list at the September meeting. Completed needlebooks (wrapped in brown paper) are due at our November meeting). If you sign up, please don’t disappoint someone in London by flaking out – bring a needlebook to the November meeting or arrange for a friend to bring it for you if you can’t make it.